What voltage is a RV battery? Which RV Battery Is Best? The best RV battery is what recreational vehicle (RV) owners rely on for backup power, off-grid systems, solar applications and camping adventures. It powers different RV appliances, such as microwaves, coffee makers and blenders and is versatile for marine and RVs. However, finding the right one for your needs can be challenging. For help on how to pick an RV deep cycle battery, keep reading the following guide on things to know and top reviews on the best recreational batteries on the market now. If you’re ready, let’s begin. If you’re looking to maximize your investment for a deep cycle marine battery, then you might want to take a second look at the Optima 8016-103 D34M battery. The best RV battery is a top-rated pick online for its performance and efficiency. It is also considered a great value for money because it offers two main purposes – as a deep cycle and as a starting battery. It is also one of the most powerful around. I noticed that the batter is ideal for RV owners that want a multi-purpose battery that offers strong cranking and sure-starting power. I also liked that the power source is maintenance-free, saving RV owners much time when it comes to using a power source for their boats o RVs. Another thing that I liked about the Optima D34M BlueTop is it’s built with the unique and innovative SpiralCell design, allowing it to deliver clean and strong power. But that’s not all, though. It is also certified and tested safe for the environment, your rig and your loved ones. The strong battery is also efficient when it comes to supplying power to recreational vehicle or boat. Other features that make it one of the top buys in the category include its ease of installation for any position. For durability, the battery is also 15X more resistant versus vibration common in recreational vehicles. And for continued performance, the battery offers a reserve 120-minute capacity. For its cranking amps, it offers 870 amps, each for marine cranking and cranking amps. When shopping around for a 12V battery for your camper, truck, travel trailer and motorhome, you must look for one that offers top performance and efficiency. 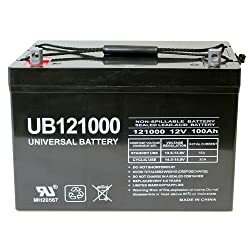 One of the top choices I found is the Universal UB121000-45978, which is a 12V 100AH AGM battery. A reason I would like to recommend this is its versatility, allowing you to mount it in different positions. You will also like its versatility, letting you use it for different applications in terms of supplying power for golf carts, wheelchairs and scooters, among other devices or gadgets needing the battery power. As it is also making use of AGM technology, it is resistant to shock and vibration, a sign that it’s durable to withstand RV conditions. Using a valve, you also have the ability of regulating its performance. I would also like to recommend this unit because it can store energy well, aside from the fact it’s also well sealed. Thus, there’s no worry about spills or leaks. Its performance won’t also be affected regardless you operate it in different positions. Speaking of durability, I also noticed its strong and acid proof plastic housing, which can deal with different weather conditions, shocks and vibrations. Finally, I liked that the deep cycle battery comes with a one-year warranty. If you’re looking for a reliable marine battery that can last long and perform well, you should not miss the VMAX V35-857 on your list. It is a top-rated deep cycle battery that’s been impressing users. For one, it offers a maintenance-free operation that makes it an ideal choice for those who don’t want to check electrolyte gravity from time to time. They don’t also have to add water to its tanks during its float service life. I would also like to recommend it for its durable grids, which are able to provide an extended service life and performance in either cyclic or float applications even following repeated over discharging. Another thing that makes it top performing is its well designed chemical and physical plate structure. It has a special treatment for added strength, reliability and high performance that beat others, such as wet lead acid RV batteries. I also liked that it is able to withstand vibrations and shocks, extending its lifespan and making it an ideal choice to those looking for a durable RV battery. You will also appreciate its tank that can protect and seal the plates in order for them to deliver a maintenance-free RV battery. When shopping around for a good RV deep cycle battery, you should look for one that offers efficient and strong performance. And if you’re searching for one designed for solar energy storage applications, you might want to check for a battery that can handle it well. A top choice in the category is the Renogy 12-volt 100Ah Deep Cycle AGM Battery. This deep cycle battery is designed for solar energy storage applications. I also liked that it offers a spill-proof and leak-free operation. 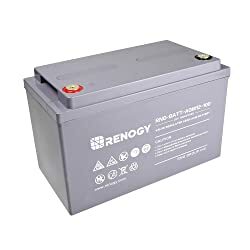 The Renogy battery is one of the best choices if you’re searching for a top performing RV battery. I would also like to recommend this one if you’re looking for a backup power or daily use battery that can withstand harsh conditions, including vibrations and shocks. It is also versatile for many applications, including for engine starters, electric vehicles, consumer electronics, lawn and garden tools, hunting and golf carts. Speaking of versatility, you will also appreciate that the battery is for photography, motorcycles, medical mobility, portable tools, power sports, access control devices and hobbies. It is definitely one of the best buys for your recreational vehicle because you can use it for other applications other than in your vehicle. Finally, I liked its optimized capability when it comes to instant high-current discharging. Do you love boondocking or dry camping in an undeveloped place without any hookup? Unless you want to exhaust your portable power generator, you must have a backup power source or one that you can recharge for continued power supply and never-ending convenience in a camping ground without any hookup. 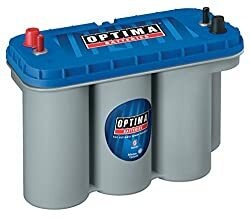 Choosing the Optima 8052-161 for your RV or boat will give you peace of mind that you will get exceptional operation time and a higher number of recharges versus what other traditional batteries. The high performance battery is also recommended if you’re looking to get more out of your electronic systems and appliances whenever you’re in an undeveloped camping ground where there is no electrical supply. Another thing I liked about the battery is that it can work well even in harsh conditions, such as constant shocks and vibrations, which are common in a recreational vehicle. With it, you won’t have to worry about the battery breaking down. One more thing I would like to note is that you will have a reliable strong cranking and sure-starting power source for your RV. I also liked that the 12-Volt battery can work even in harsh outdoor conditions for its strong cold cranking amps reaching 900. Overall, the Optima Batteries 8052-161 is a great choice if you’re looking for top performance and durable battery for boondocking. 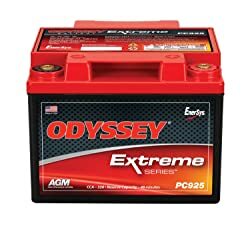 The Odyssey PC925 is one of the most reliable choices when it comes to the best battery for a travel trailer. It is a good source of backup power for your solar panel or generator. With it, you can keep the comfort of your loved ones who enjoy using their devices when onboard the RV and when in the camping ground. I like to recommend the battery for its power and durability. When compared to other batteries on the market, this one can last up to 70 times longer than traditional batteries out there. By saying that it also means you will be getting more of your investment when buying an RV battery. I also appreciate its recharge efficiency and sturdy built. One of the things that I want to mention about its durable features is its high resistance to shocks and impact, which are two common conditions in a recreational vehicle. Another thing great about it is it overall durable sealed design that makes it leak-proof and spill free. By saying that means it is reliable and safe to use, giving you peace of mind it won’t have leaks throughout its lifespan. I would also like to recommend the RV battery for its power of supplying up to 330 cold cranking amps, giving you ease and convenience when starting your appliance or vehicle. Finally, I appreciate that it can be positioned in a number of ways, as it can also tolerate even extreme temperatures. Nevertheless, the Odyssey PC925 is a top-rated product for its solid performance and heavy-duty components. It can maximize your investment for a backup power source. 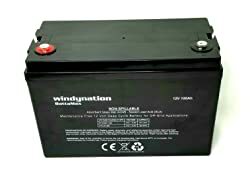 The WindyNation deep cycle AGM battery is one of those not to forget when looking for an efficient and reliable RV house battery. If you’re looking for an off-grid or backup power source, this unit is a top contender for its ability to supply power for multiple applications, including floor cleaning, aerial work platforms, inverters, golf carts, material handling, inverters, oil and gas, remote telecom and recreational vehicle, among others. I also liked its no-spill design, which also makes it suitable for a wide range of uses, such as shopping centers, airports, healthcare facilities, educational institutions and so many more. The best RV deep cycle battery is valuable for its versatility in many applications, such as healthcare facilities, airports and shopping centers, among other places. I would also like to recommend it because it is ideal for deep cycle performance in which the battery will be charged and recharged repeatedly. Even if it is, the battery will keep performing well. The WindyNation battery, which offers 12 volts, is a heavy-duty product that has durable plates for maximum lifespan. It is good for off shore marine power, solar systems, portable tools, UPs, recreational vehicles and so many more. Finally, it is made with pure virgin lead, allowing for maximum storage power and low discharge rates. It also has a float life reaching up to 12 years and at 25 degrees Celsius. Overall, you should not miss the WindyNation 100AH when comparing your options and looking for the right battery for your rig. 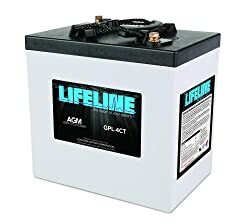 If you’re looking for a travel trailer battery that delivers supreme performance and that supplies consistent and clean power to your RV electronics and device, you should not miss the Life P04 deep cycle battery. This product is made in Reno, Nevada, guaranteeing it’s made of high quality components and offers solid performance. The lithium-ion phosphate deep cycle is designed and created for deep cycle charging and recharging for thousands of times. You will love its versatility for use in many applications, such as marine, trucks, recreational vehicles, camping grounds, healthcare facilities, events and job sites. It is also an ideal battery for off grid power system and remote places where there are no hookups. With that said, you could have peace of mind that there is available power wherever you are. I also liked that it has added versatility for its user for systems, including 36 and 48 volts. In addition to these things, users also liked that it is powerful even at only 29 lbs. It is able to deliver the power of a lead acid battery weighing 140 lbs. The battery can also last up to 10 X longer than traditional batteries on the market do. For other features, I like that it can last up to 5000 cycles and offer acceptable charging voltages up to 14.6 volts. Overall, it is a great choice for its solid features and top performance. It is reliable and heavy-duty. The Life P04 can also deal with harsh weather and outdoor conditions, keeping it top performing for a wide range of applications. This 6V battery packs a punch when it comes to performance and reliability for its compact size and weight. One of the solid features I love about the RV battery is its rugged design. The battery’s housing is made of a non-conductive ABS plastic material, keeping it in top condition even with constant exposure to harsh elements, including heat, weather and chemicals. In addition, it can resist vibration and shock, keeping your battery in a good shape throughout its lifespan. I also liked that it is maintenance-free, ensuring that we can experience convenience for choosing the battery. But aside from requiring no maintenance, the product is also easy to install, meaning setting up is a breeze. That’s one of the features you should be looking for when shopping around for a replacement or a new RV battery. The sealed lead acid battery is made of durable materials, making it ideal for use in many applications, including for emergency lighting system, alarm system, firefighting equipment, telephone switching system, standby power supply, electric wheel chairs and uninterrupted power supply. With plenty of uses, you can maximize your investment on the NP6-225Ah 6V 225Ah deep cycle battery. NPP is also one of the most reliable brands when it comes to quality control. This product is backed up by a one-year warranty. Nevertheless, this product is one of the best in the category that you should not miss when comparing your choices based on the list that we have featured here today. The best RV battery is one of the most reliable deep cycle batteries for its versatility and flexibility for plenty of applications. It can be used for marine, camper, trailer and trucks. The made in the USA product is a high performance AGM battery that requires no maintenance. It simply means that it is also convenient to operate or use. In addition, the deep cycle battery is well sealed so it won’t leak or spill. You don’t also have to mind about an acid clean up in this case. Another thing I liked about the Lifeline GPL-4CT is that it is made to handle shocks and vibrations in the recreational vehicle. It only means that we don’t have to worry about the battery breaking down due to harsh conditions. This product is also built to withstand extreme weather conditions. You can be sure that it will operate even in hot or cold weather. So if you’re looking for a reliable power source for solar applications, marine or RV, you shouldn’t miss the Lifeline GPL-4CT. It is one of the top picks on the market that proves to perform well even in harsh conditions for its solid built and heavy-duty components. RV batteries are used for many applications, including on coffee makers, water pumps, microwave ovens and blenders, among other appliances. But then, there are many kinds of RV batteries, so you need to know about each of them in order to find the best one. In the following, we’ll talk about the common types of RV batteries that you can compare and choose from for use in your rig. Find the three main types of RV batteries. But under deep cycle batteries, you will find four types, each with their characteristics. Before buying one, find out what makes each unique and specific for your needs to come up with a good buying decision. What makes starting batteries unique is that they work using a number of thinner plates, which are able to maximize the surface area being exposed to the electrolytes, providing high amounts of energy working in short bursts. They’re rated based on cold cranking amps. What are these? They’re the amps number that one battery can supply at 0 degree F for a period of 30 seconds without dropping below only 7.2 volts. In this case, these batteries must not be used for RV deep cycle battery uses. You should know its ways of workings if you’re deciding to buy one for your rig and maximize its use and efficiency. Deep cycle cells or batteries have varying sizes, with larger ones supplying more amps to your rig. So when it comes to choosing one, you must determine your power requirements as well as space available in your RV to select and install the right one. A flooded lead-acid type is also called wet cells. It is notable for its flooded appearance due to the electrolyte fluid surrounding the plates, which have to be submerged totally. Its use originated from a lead-acid chemistry discovery made by Gaston Planté in 1859. This type is the most common and popular among deep cycle batteries used by RV owners for their rig. The electrolyte is a mixture of water and sulfuric acid surrounding the lead-oxide and lead plates. Flooded types deal with overcharging better than AGM or gel deep cycle batteries because they’re unsealed and due to its hydrogen venting system. AGM deep cycle lead-acid batteries are applicable for many applications, such as in boats, trolling motors, trucks, campers, travel trailers and recreational vehicles. They’re also better than flooded batteries because they don’t need frequent maintenance. These batteries are also tougher and stronger than other types of deep cycle batteries. These batteries also have a different design from a flooded deep cycle battery. Here, the electrolyte is in the glass mats, not flooding the plates freely. AGM batteries have thin glass fibers attached or woven into a mat, holding enough electrolytes due to the increased surface area. Gel batteries are also popular among RV owners because they’re easy to transport and move around than other types are. However, they also offer the same benefits over the flooded types. 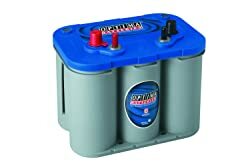 Gel deep cycle batteries are preferred by those who are planning to use their batteries in tougher situations and places with high vibrations and temperatures. However, these batteries are more expensive than an AGM battery even if they might have the same battery capacity. Gel types are not also recommended if you don’t have enough experience working with battery chargers and batteries. But in general, the gel deep cycle battery is used in solar power uses. For a better battery, the lithium-ion type is chosen by recreational vehicle owners due to its supreme performance far better than AGM or flooded lead-acid batteries. This type is also advantageous for those looking to use a lighter battery type offering a charging efficiency reaching up to 5000 life cycles. Most RV owners also pick the lithium battery because of its steady performance under extreme temperature conditions, such as cold and heat. In addition, the deep cycle battery is very efficient even when running at low temperature. In fact, it can also operate safely in a place where the temperature is up to 149 degrees Fahrenheit. In addition, it offers versatile mounting, providing with consistent energy flow in any direction throughout its use. A dual-purpose battery can offer supreme starting power together with cycling capabilities. It is also used with a switch system or an isolator, functioning as a backup for a deep cycle house battery or starting battery. Dual purpose or marine batteries can handle starting and cycling, but then, most of them will not be able to start an engine when compared to a true cranking battery. It might not also be able to handle numerous discharges and recharges when compared to a real deep cycle battery. Take note of these things before deciding to buy a marine battery for your rig. First, what is voltage? It’s the pressure coming from a power source’s electrical circuit, pushing current or charged electrons through a conducting loop. Following you can illuminate a light or supply power to your recreational vehicle electronics. Now in order to understand voltage better, remember that RV batteries are running on a 12V DC power deep cycle electrical energy, although does not apply to all. When choosing an RV battery, consider the amount of power you need for your rig. 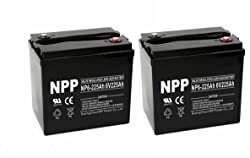 So before you choose a deep cycle battery to discharge and recharge repeatedly without damaging the battery know what voltage rating is available. This RV battery system lets you operate a computer, TV, microwave, lighting and other types of electrical appliances. It is also used in charging some systems present in your recreational vehicle that are using 12V power. A 12V system also works in a parallel connection in order to maintain a continued 12V connection. In most cases, you will see them with two jumper connections, which work to keep the 12V system. Why you might want to use a 12V RV battery? It gives out double the amp hours, consistent 12 volts power, easy to buy in auto parts stores, and less expensive versus the 6V type. The drawback, however, is much less amp-hour rating for each battery. Generally, it is a golf cart battery, one of the most versatile and useful batteries for someone living off the grid. The 6V battery system is also chosen by small home or cabin owners. The 12V models are also chosen by many camper or travel trailer owners. It all boils down to your personal preference and power needs. One difference it has with the 12V battery is that it operates in a series connection to achieve a 12V system required for your recreational vehicle. For their pros, these batteries have larger amp-hour capacity, longer lifespan with good maintenance, and greater discharge and recharge capacity. The only problem is that its initial cost investment is much expensive than the 12V models are. When trying to compare, you might be asking why choose one over another battery. That is a good start. If choosing between 6- and 12-V systems, you should remember that 6V types are larger but lighter only about 45lbs versus a 12V type that’s about 100lbs. Today, many RV owners are upgrading to 6V systems for a single power source. For one, the series connection tends to last longer while at the same time supplying double the voltage. Also, 6V systems tend to last longer because of more space for each cell and thicker plates. But then, going for 12V systems will give you twice the amp-hours and voltage. Definitely, both types have their pros and cons. To choose well, determine your power requirements and RV space you have. When deciding for which RV battery is best, we’ve put up a guide on the different types of RV batteries to choose based on the application for which you intend to use one. As there are many types of them, such as AGM or flooded types, you must check for which type will meet your needs. 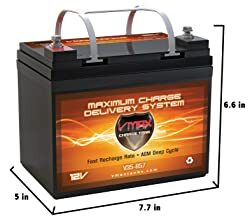 For example, in the following, we’ll talk about certain types of deep cycle batteries intended for dry camping, boondocking, travel trailer and for the money. Based on your purpose, find a guide on what to look for and what makes each battery ideal for your specific application. The battery for dry camping keeps consistent power supply to your rig and its appliances. It is a good backup power supply for your generator. One can be used for solar power applications. 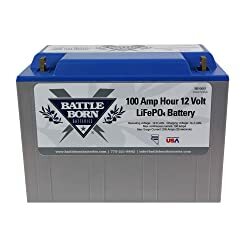 A good battery for dry camping use is a lithium-ion deep cycle battery meant for off grid systems and other applications. It is versatile enough that you can use it from any positions. One is also lighter than a lead acid cell and offers low voltage sag even during a high discharge. The best RV battery for dry camping is also able to support large inverters. It is also quick to recharge due to high charge acceptance. If you’re planning to go boondocking, you will need much energy stored. In this case, you might want to use up to six units of 6V batteries. And for the common type of battery, deep cycle 12V lead-acid batteries are used because they’re designed and made for charging thousands of times versus traditional batteries on the market do. For the best results, you should make sure that your house batteries are fully charged. When you reached the camping site, you must monitor how they’re doing to ensure they’re not draining too deeply. As the recreational vehicle takes more power than a typical van or car, you should use a deep cycle battery meant for the travel trailer. It must be designed and meant for repeated charging and recharging for thousands of times. The travel trailer battery is a good source of backup power for solar applications and portable generators. It compact and lightweight yet it packs much power enough to handle your electrical needs. The best ones can last up to 70 times longer than other common car batteries. They’re also sealed, leak proof and spill-free. The best RV deep cycle battery for the money is one that is priced competitively, yet it can deliver powerful performance. When choosing an RV battery for the money, you must consider the type, your energy usage and demand and budget. For one, you must narrow down your choices based on the amount of money you’re willing to spend on the purchase. You should not worry, though, as we’ve outlined picks, which are affordable yet efficient in delivering superb performance, such as serving as storage for solar energy applications. You can also choose one that has a low discharge rate, meaning low self-discharging when not in use. In addition, you should pick one based on your energy demands. That said, you have to calculate your overall power needs based on the appliances you plan to run and how much time do you operate each. These are only some things to consider when picking an RV battery for the money. Knowing how to charge your RV batteries, you will be able to maximize its lifespan while also maintaining its efficient function. As you probably know, certain types also have different requirements when it comes to charging time. But as a general rule of thumb, you should take safety precautions through inspecting the electrical system and the battery. The safety practices can make sure that your rig won’t be damaged and you can keep yourself out of trouble. For added security, you should also inspect the battery prior to charging for increased security. For a guide on how to charge the RV battery using a generator, a solar panel, an inverter, a battery charger or a converter-charger, keep reading in the following section. One of the best ways to charge the RV battery is to use your generator. Just make sure it is fully charged. You might also want to check if it is plugged into your AC outlet. To avoid accidents, you should check that the RV is turned off with your emergency brake engaged. The battery’s charging time is dependent on the weather. Remember that you might not get full capacity if the temperature is below 40 degrees. To maximize charging, you should also turn off the RV appliances. Once charging is done, manage your energy use well. Other RV owners choose this method whenever they need to charge their RV deep cycle batteries. It is also an efficient and money saving way of charging the battery due to the free power coming from the sun. For those who don’t have a solar panel installed, they need to have one installed, though. If you have the solar panel, it is connected to the battery and charging unit or inverter for a continued power source. For maximum charging, you must check that the solar panels are facing the sun all the time. Another method to charge the best RV deep cycle battery is to use battery charger. This charger is a portable device, which has both negative and positive clamps that you must connect to the battery directly. You should disconnect the battery to use this device in order to charge. To ensure the charging is done, check the indicator light that turns on when the battery is fully charged. Turn off the charger and detach the connection from the black clamp. Make sure that you follow these tips when charging the battery with jumper cables or battery charger. You can also charge your RV battery using a converter. This device works by converting a 120V alternating power into a 12V DC. The only problem is that it might not be the efficient means of charging the RV battery because such can only supply an average of 40 amps. It also only charges the battery at up to 5 amps. So if you’re battery is drained or depleted, you need a lot of time to charge it. Remember these things if you’re planning to charge the battery using the converter. There you have what to know about the best RV battery and top picks to compare to come up with an informed buying decision. Again, understand the types of deep cycle batteries, ways of charging them and top features each of them possesses. Refer to this guide and shop for the best RV deep cycle battery today!